STUDIO TRON is a real street dance studio made up of Japan’s top dancers, including world champions. From Kids Classes to fitness classes aimed at homemakers, you can take a wide variety of lessons. We’d like everyone, from those learning codance for the first time to those with dance experience, to try our classes, so we’ve created a 2 Time Trial Lesson system! Give STUDIO TRON’s Lessons a try! An initial registration fee of ￥1,080 will be charged. This offer does not apply in cases when the Membership Application is made after the date of the trial lesson. 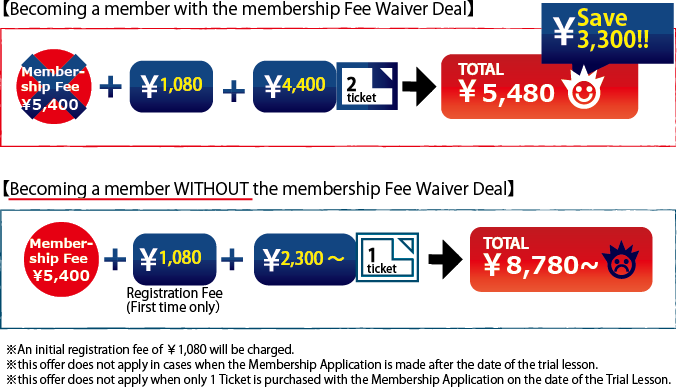 This offer does not apply when only 1 Ticket is purchased with the Membership Application on the date of the Trial Lesson. 2 Trial Lessons are recommended! In addition to useing the 1month term of validity to try other lessons, you'll have until your second lesson to decide whether or not to become a member. Things to bring: Indoor shoes and clothes that are easy to move in. STEP 2 After you fill out the Trial Lesson Application Form, head to your lesson!! If you have purchased 2bTrial Lessons, you will be issued a "2 Trial Lesson Ticket". You can take the same class, or any other class, within a month of your first Trial Lesson. ※If you lose your "2 Trial Lesson Ticket" you will not be able to take a second Trial Lesson. Please take care not lose your ticket. STEP 3 End of the Trial Lesson. Will you take advantage of the Joining Fee Waiver Deal? 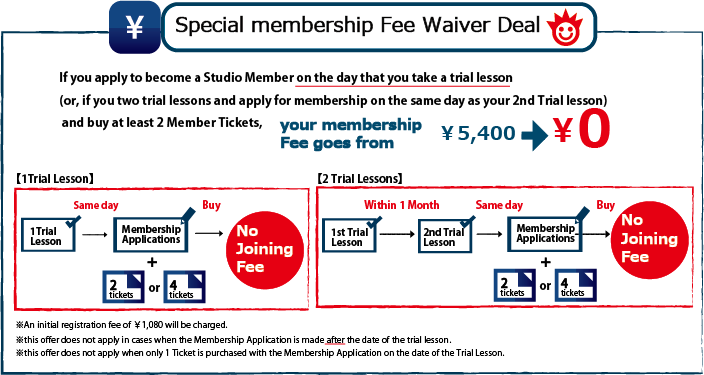 STUDIO TRON's Membership Fee Waiver Deal reduces your initial membership costs. This is absolutely recommended if you're going to continue dancing with us!! Buy 4 Tickets and get a Drink Ticket for Kitchen TRON on the 2nd floor FREE!! STEP 4 Fill in the membership Application Form. You will be issued a member Ticket. Tickets are valid from the day that you start using them. If Tickets are lost, a re-issuing fee of ￥1,080 will be charged. Please come to the Studio after checking the Class Cancellation and Substitute Teacher information. STEP 5 Choose a class and take your lesson! Copyright © 2019 office Calm All Rights Reserved.